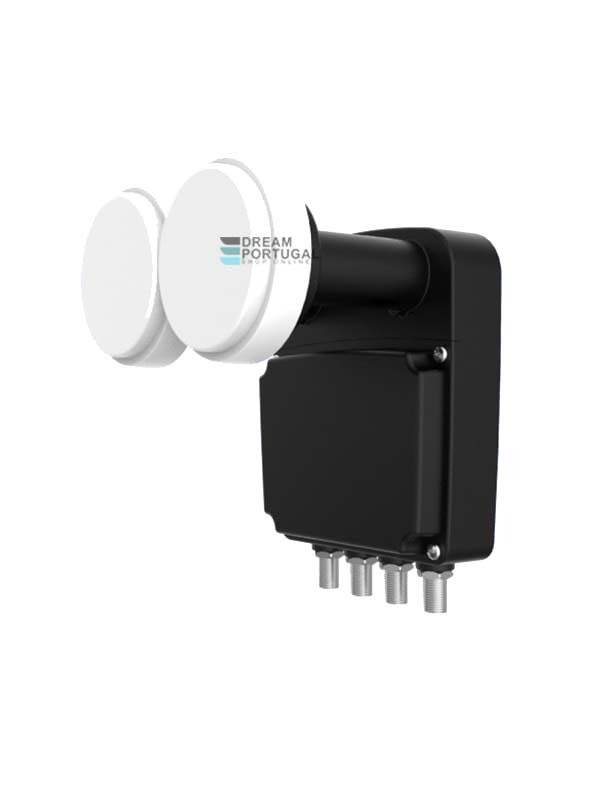 Inverto Quad Monoblock 23mm LNB 4.3° for 80cm dish - Buy at dreamportugal.pt! This Inverto Lnb was specifically designed for the European DTH markets, this Monoblock LNB allows for dual satellite reception. It can be used for satellite broadcast reception (on an 80cm dish antenna) of the Astra 19.2°E and 23.5°E satellites spaced with 4.3°. This LNB enables the signal distribution to maximum four Set Top Boxes with Single Tuner (or two STBs with Twin Tuner). It is optimized for High Definition transmissions and provides excellent Noise Figure performance. Designed to meet strict specifications and manufactured to the highest industry quality standards, this LNB is an ideal solution for satellite broadcast reception across Europe. LO temperature drift - ±3.0 MHz Max. LO accuracy @ 25 °C - ±1.0 MHz Max. LO phase noise @ 10kHz - -90 dBc / Hz max. Gain variation (over full band) - ±4dB max. Image rejection - 40 dB min. 1 dB compression point (@ output) - 0.0 dBm min. Cross polarization isolation - 22 dB min. In band spurious level - -60 dBm max.